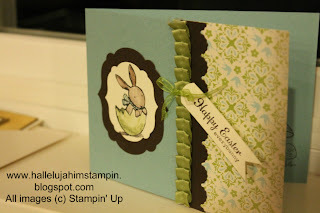 Paper Pumpkin is a fun way to put some easy, quick STAMPIN’ in your life! When you join Paper Pumpkin you will receive a Stampin’ kit each month. The kit contains everything you need to make a project (or several). Everything is measured and cut so all you have to do it put it together. Stamps, ink, paper, accessories and photos/instructions are included (use your own adhesive). It’s a little crafting retreat that comes to your door each month! And the projects are not complicated. The idea is just to have everything you need for an hour or two of creating. You can join and quit at any time. There is no sign up fee. You can even skip a month if you want to. If you join now you will receive the first 2 kits for only $10 each! The promotion runs till AUGUST 31 ONLY. I just signed up and can’t wait till my first kit comes! Be sure to put me in as your demonstrator…thanks! 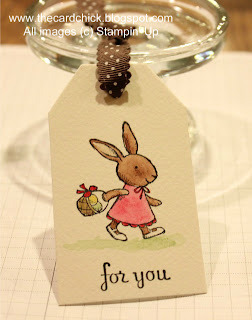 So, when I first looked at the Everybunny stamp set in the Stampin' Up Idea Book and Catalog I wasn't too excited about it and it wasn't anywhere on any of my lists (there's the "definitely" list, the "probably" list, the "will get it eventually" list, and the "MUST HAVE NOW" list). Then, this spring, the BFF decided we should take another look at it and sure enough we decided it was worth getting. Now, I love those stinkin' little bunnies, chick and toadstools! I made these gift tags for the attendees of my last class. The gift was a simple glass candle holder for a taper candle. I purchased them at various thrift stores. The great thing about these is that they work perfectly for holding a bottle of Tombow Multipurpose Liquid Glue (#110755). The glue is really thick and it takes awhile to get it to the tip. If you store it upside down in a candle holder (even without the lid on) it is always ready to use and you don't have to wait for it. Thanks, BFF for the tip. You can read her blog here. The tags were done on watercolor paper (#122959). I used Black Staz-On ink (#101406) and an Aqua Painter (#103954) with Watercolor Wonder Crayons (#119802, 119804, 119805). The ribbon is Chocolate Chip Scallop Dots (#124142). Here is the Everybunny card we made at my Easter class. Julie Ujano designed this beauty. Click on "here" above to see her blog. Thanks, Jules! Again, the image is stamped with Staz-On ink and colored with the Watercolor Wonder Crayons. The bunny and the Early Espresso layers are made with the Labels Collection Framelits Dies (125598) using the Big Shot (#113439). Cardstocks used were Baja Breeze (#111352), Early Espresso (#19686) and Very Vanilla (#101650). The Designer Series Paper is Everyday Enchantment (#126154) and is part of the SALE-A-BRATION product series that you can earn for free with a $50 purchase...ONLY THROUGH MARCH 31!!!! The ribbon is the Satin Pleated Ribbon, Pear Pizzazz (#125568). That's all for now, dear readers! Think bunny thoughts!!! I mean this has to be the most neglected blog in the crafting world! I shall quit apologizing, because it makes me sound like a weenie, which I am...a blogging weenie. There, enough said to ease my guilt and create a transition to this post from the last one which was in a different year...sigh. Here, even though it's over, and we are all WAY past it, because I love it and hated to put it away, is my St. Patrick's tower. I change the tower several times a year to go with the seasons. I just started doing St. Patrick's in 2011 and because it is kind of new for me (although most of the stuff I have had for a long time), I love it. Green is my favorite color and that is another reason this is one of my current favorites. SHOP THROUGH MY ONLINE STORE FOR SOME GREAT DEALS. Christmas class! Here is a sneak peak. I also started decorating for Christmas tonight! Not the major stuff, just a few little things. Usually I have vintage glass ornaments on my Stamp Room tree. The photo is all the explanation needed for the vintage balls staying safe in their boxes this year and the shatterproof ornaments taking their place. Who knows when the vintage lovelies will make an appearance again. I finally have finalized my final events of the year! Make a beautiful picture frame dry erase board to display in your entry way, kitchen or office. These make great gifts! Class includes picture frame (white or black), 4 seasonal designer paper backgrounds, 4 ribbon roses and a dry erase marker that attaches to the back of the frame. You will choose your backgrounds and coordinating ribbon and learn how to make ribbon roses. When you sign up let me know if you would like a white or black frame and if you have a glue gun you can bring. *Note: I will run a Tuesday (Nov. 15) evening class if I have at least 2 people who would prefer that night. Just let me know. I am currently in the planning stages for this class, my favorite class of the year! Sign up to hold your spot and find a friend to come with you! More details to come. I would like to know if anyone is interested in doing the card box class. The box is shown on page 35 of the Holiday Mini Catalog. The class would include covering the box top, making the flower for the top, labeling the dividers that go inside and 2 cards. You will be able to choose the paper for your box top and flower. This class would be scheduled the first week of December* and would cost $35. *I would also be willing to look at the first week of January. The box won’t be available after January 2, 2012, so I would have to have firm commitments as I would have to order enough boxes beforehand. I will hold this class if I have interest, so let me know if you would like to do it and I will let you know as soon as I know…so we will all know. Okay, that’s it!!!! If you read all the way through this email you get a gold star stamped on your hand along with my sincere thanks! Let me know if you need any help designing your holiday cards and projects. I would be glad to assist you! And on that note…let the holiday stampin’ begin! June is a big month in the Stampin' Up world. We get ready to say "goodbye" to a shopping cart full of stamp sets, supplies and accessories that are being "retired." There is a frenzy of "Last Chance" shopping and some grieving that goes along with it...."How can they be getting rid of THAT?!" And right behind all of this is that NEW CATALOG AND IDEA BOOK that we all can't wait to get our hands on and look through 50 times to absorb every nuance! My June class will be a "Fond Farewell" class. We will be using stamp sets that are soon to be gone (but not forgotten). We will also be doing a few projects with a patriotic flavor. Sign up by clicking here. There will be some giveaways and as always if you bring a first time friend, both you and the friend receive a gift! Here is a photo of a birthday gift for a friend of mine. The geraniums weren't blooming so I created my own flowers using the new Stampin' Up In Colors (plus Real Red) and the Fun Flowers #121812 die. I looooooove the new colors and am so looking forward to creating with them! I am thankful flowers are blooming outside...they always do even when the weather has been not very nice since last August. Somehow, those plants get enough light to produce beauty and I am thankful for that! Well, time to get stampin'!